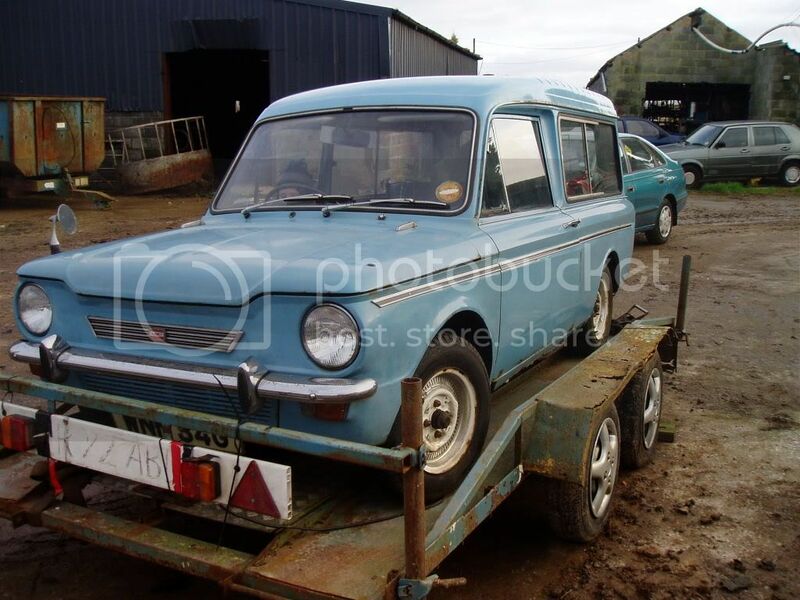 Commonly known as the Imp Estate, this little vehicle has been much maligned by many. The loading space in the rear is a very sensible shape due to the 'square' design, and much can be carried along with a full compliment of passengers. Production began in April 1967 and continued until July 1970, the final production year for many models after Chrysler's takeover. 4777 Huskies were made until October 1968. Then they got a 'face lift' together with the rest of the Imp range. Afterwards around 6000 were built. The Husky has sliding side windows, which allow free passage of fresh air on hot days without draughts. Unfortunately these are also the source of leaks in many cars. In its standard form it has the spartan interior of the Imp de Luxe. No glove compartment, no temperature gauge and usually only shaped rubber mats for the floor. Of course many owners have added Super Imp or Chamois trim to their cars by now to improve the creature comforts. Some of the "Huskys" here are actually vans converted with non opening rear windows, have heard them called "Vuskys", they are listed here because they have rear windows so by my logic are not vans. 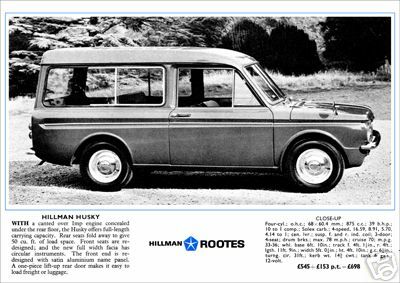 ROOTES introduce estate car version of the rear-engined 875 cc. Hillman Imp. It provides a maximum of four seats and 25 cu. ft load capacity or two seats and 50 cu. ft, has stiffer springing and uses the standard engine. 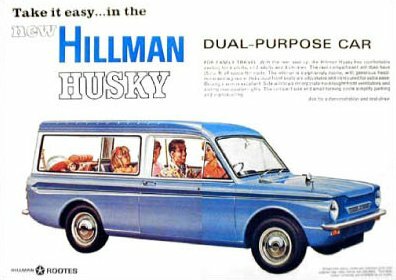 Ever since the Hillman Imp was used as the basis of Britain's only rear engined small van (the Commer), people have been expecting the Rootes Group to add some windows, a couple more seats and appropriate trim to provide a new small estate car. There has been a gap in the range since the original Husky was dropped; the new one will suit many people's wants. Like its saloon parent, the Husky is being built at the Linwood (Scotland) factory. To give the necessary extra volume, the original rear roof line has been extended and raised-the raising being necessary because of the relatively high floor to the luggage space over the rear engine. It is reinforced with stiffening ribs and has synthetic foam noise-deadening material fixed underneath, which also helps protect rear passengers from injury in an accident. The body differs from the Commer's at the side window apertures, which are stiffened; the windows are only obstructed by the overlap between the back fixed glass and the sliding front part. Again because of the load floor height, the squab of the bench back seat is actually in two pieces; the lower part is fixed and fills in the gap between the seat cushion and the bottom of the hinged upper piece. This is locked in its erect position by a pair of simple plated bolts on each body side. Releasing these allows the squab to be folded forward to rest on what were the back seat passengers' armrests. Black rubber mat covers the floor; a substantial lip on the end of the seat back prevents baggage sliding forward under braking forces into the front seats.